How much did we spend on our pets in 2016? An estimated $62.75 billion! (That’s a whole lot of squeaky and organic chew toys.) The good news: Besides the love, loyalty, and affection you get from your beloved pets, they can also save you a chunk of change on your taxes. If you know how. Check out these five pet tax deductions which can save you big bucks, thanks to Humbert the Halden hound, Roland the Russian blue, or Gordo the goldfish. 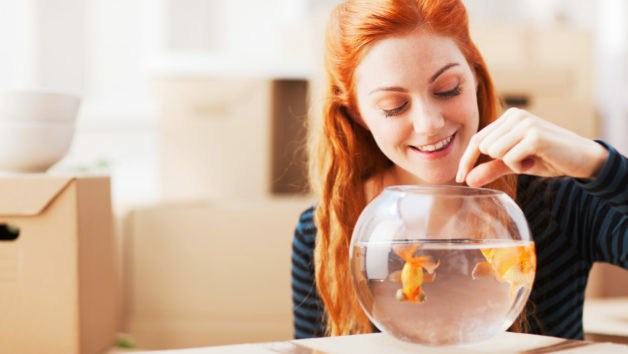 If you moved last year for work, you can claim the entire cost of moving your pet—whether it has fur, wings, or scales—as part of your eligible moving expenses, says Josh Zimmelman, owner of NY–based accounting firm Westwood Tax & Consulting. You can claim a guard dog only if it actually protects your place of business—which could be your home office. The IRS isn’t likely to be believe that your nervous Chihuahua has been trained to sic the bad guys, so if you’re planning to go down this route, make it a certified guard dog from one of the traditional guard breeds such as a German shepherd or Rottweiler. At least make it a large dog. Pit bull, yes, miniature schnauzer, not so much. If your pup meets those requirements, you can deduct the cost of keeping the dog healthy—like what you pay in food and vet visits—as business expenses. And get this, you can also deduct the cost of the dog itself (if you paid for it) over seven years. “Apparently that’s how long the IRS thinks guard dogs last,” says Wendy Connick of Connick Financial Solutions. Here again, your tabby can’t simply pounce on the random mouse in the house—the cat has to be a “working pet” patrolling a business or home office. If so, you can deduct the cost of its purchase and upkeep in the same way you can with a guard dog. It also helps if you can show good reason to need such a pest patrol, like you’re living next door to a landfill or other source of vermin, says Connick. According to the IRS, if you are visually or hearing-impaired or have other disabilities, you can deduct the costs of buying, training, and “maintaining” a guide dog or other service animal that assists you. (The IRS considers maintenance as food, grooming, and veterinary care.) The animal can also be used for therapy, such as in the treatment of post-traumatic stress disorder. You’ll need a doctor’s note, of course—just because you feel better after petting your cat won’t cut it. If you’re a homeowner fostering an animal for a shelter or a charity such as Guide Dogs for the Blind, you can also claim an itemized deduction. The costs of caring for the pet—food, litter, and veterinary bills—are considered a charitable contribution and can be deducted as such, says Connick. Consider it just one more reason to help any furry friends in need.